Welcome to the official Clan Campbell Society (North America) website. Explore the history of Clan Campbell and its septs, Clan Campbell activities in North America and around the world, Scottish history and heritage, Scottish Highland Games and Campbell genealogy. The Clan Campbell Society (North America) site provides information about our shared Campbell heritage and customs, Campbell music, Scottish events and festivals. 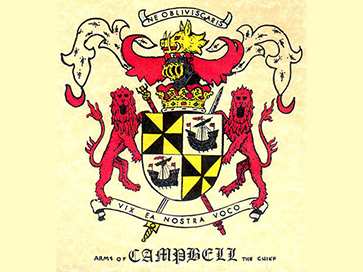 Many a Campbell and member of a Campbell sept has sought the answer to that question upon first becoming interested in his or her Scottish heritage. There is only one authority on the correct tartan or tartans of a clan: the chief of that clan. 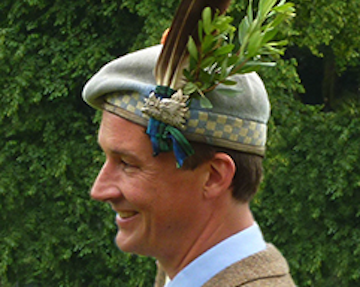 Torquhil Ian Campbell, (born 29 May 1968) Chief of Clan Campbell, the 13th (S) and 6th (UK) Duke of Argyll, inherited the title on 21 April 2001. The family's main seat is Inveraray Castle where the Duke and Duchess live with their three children. Historically one of the largest and most powerful of the Highland clans, Campbell lands started in Argyll in the west, east to Perth and Kinross, and extended to the north as far as Nairn. Clan Campbell origins are placed amongst the ancient Britons of Strathclyde. Col. Joe McD.Campbell, USAF Ret.